Befitting his love for the Indianapolis 500, Father Glenn O’Connor always went full throttle in his efforts to reach out to people—and connect them to the life and love of Jesus Christ. The pastor of St. Susanna Parish in Plainfield also did it through his work with Seeds of Hope, a center for women who are trying to reclaim their lives after their addiction to drugs and alcohol. Indeed, Father O’Connor—who died of cancer on March 15 at the age of 66—leaves a legacy of planting seeds of hope, love and faith in people’s lives, and helping them grow through his humor, healing, energy and generosity. Visitation for Father O’Connor will be on March 22 at St. Susanna Church in Plainfield from 12-7 p.m., followed by a vigil service at 7 p.m.
Visitation will continue on March 23 from 9-11 a.m. at SS. Peter and Paul Cathedral in Indianapolis. The Mass of Christian Burial will immediately follow at 11 a.m., with Archbishop Charles C. Thompson as the principal celebrant and Msgr. Joseph Schaedel as the homilist. Burial will follow in the priests’ circle at Calvary Cemetery in Indianapolis. He also had a special love for the “underdog,” said Marvetta Grimes, executive director of the Seeds of Hope program located on the grounds of St. Joseph Parish in Indianapolis, where Father O’Connor previously served as pastor and co-founded the program. His connection with people also extended to the cross-section of humanity that came to the Indianapolis 500 every year. Known as “the priest in the pits,” he walked comfortably amid—and joked naturally with—fans and famous drivers alike for more than 40 years there. His outgoing nature combined with his sense of humor and his love of all things Irish especially endeared him to that ethnic community in Indianapolis. “He took great pride in being Irish, and he was at all the Irish affairs,” said Jim McGinley Sr., four-time president of the Indianapolis chapter of the Ancient Order of Hibernians. “But here’s what really stood out. He used that humor often in his homilies, but he always made sure the laughs helped lead people closer to God. “This guy walked on a tightrope, and he got really good at it,” Father O’Connor began. “He went farther and higher, and pretty soon he took the net away. Then he pushed a wheelbarrow across the tightrope. And next he put a person in the wheelbarrow and pushed it across the tightrope. Helping others to trust in God was the essence of Father O’Connor’s life and his ministry as a priest, said Deacon Charles Giesting, who served with him at St. Susanna Parish. Deacon Giesting said he marveled at how Father O’Connor “was a fast mover” in performing “all the priestly duties” that included leading the parish, visiting the sick, preparing couples to be married, administering sacraments, working with the school children, and serving as the Catholic chaplain of the Indianapolis International Airport. “He was ‘flying’ in and out all the time, to always try his best to serve God’s people,” the deacon said. Glenn Leo O’Connor II was born on July 6, 1952, in Washington, D.C., to the late Glenn and Eileen (Hughes) O’Connor. After moving to Indianapolis, he attended St. Matthew the Apostle School and the former Latin School, both in Indianapolis. He received priestly formation at the Latin School, the archdiocese’s former high school seminary, the former Saint Meinrad College and Saint Meinrad Seminary and School of Theology, both in St. Meinrad. Archbishop Edward T. O’Meara ordained Father O’Connor a priest on May 17, 1980 at SS. Peter and Paul Cathedral in Indianapolis. His first pastoral assignment was as associate pastor at St. Gabriel Parish in Connersville, where he served from 1980‑82. He then ministered as associate pastor of St. Simon the Apostle Parish in Indianapolis from 1982-85. He became pastor of St. Philip Neri Parish in Indianapolis 1985, where he served for six years. 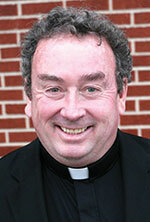 In 1991, he became administrator of St. Joseph Parish in Indianapolis. Two years later, he also began serving as the Catholic chaplain at Indianapolis International Airport. In 1997, he became the pastor of St. Ann and St. Joseph parishes, both in Indianapolis, while continuing to serve as a chaplain at the airport. Since 2012, he served as the pastor of St. Susanna Parish while continuing as chaplain at the airport. He also served as the chaplain of the Indianapolis chapter of the Ancient Order of Hibernians, a chaplain for the Indiana Department of Corrections and a spiritual director for the Central Indiana Cursillo movement. Even with his intense schedule, family members recall how he always found time to deliver birthday presents to each one of his more than 80 relatives. Surviving are his siblings Maureen Guimont, Kathy Flynn, Thomas O’Connor, Timothy O’Connor, Sean O’Connor, Mary Jubak and Molly Hoying. He also had 25 nieces and nephews, and 29 great-nieces and -nephews. In lieu of flowers, memorial contributions may be sent to St. Susanna Parish, 1210 E. Main St. Plainfield, IN 46168, and/or Seeds of Hope, 1425 S. Mickley Ave., Indianapolis, IN 46241.